Valid 23 April to 31 May 2019: 40% discount on standard rates. 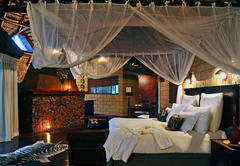 Zwahili Private Game Lodge is a 5 star graded game lodge offering Modimolle accommodation in 10 guest rooms. 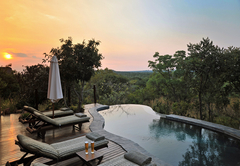 At Zwahili Game Lodge where the most spectacular sunsets are experienced from the extended timber deck, you'll find unsurpassed peace and tranquillity while in the distance nocturnal life comes alive. 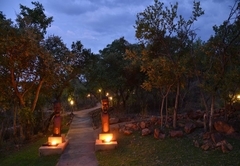 Zwahili Game Lodge is situated approximately 2 hours North of Johannesburg in a malaria free area. 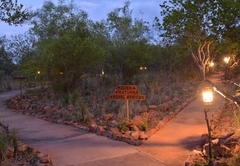 As the Southern Cross and Orion's Belt, garland the dome of the night sky, the distant smell of campfire from the open air boma welcomes the guests back from their early evening game drive. The faint call of tribal drums announces an array of culinary delights to appease even the most discerning of palates. As a night-cap, Zwahili offers evening viewing of the game almost on the front lawn. Luxury en-suite rooms await you. In sharing the splendour of a more grandiose era. 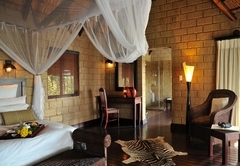 Embrace a true African experience in comfort, style and luxury. Crisp white pure percale cotton linen and dark wood finishes creates the perfect ambience. Rooms are joined by timber walkways, leading onto an extended timber deck. The joys of a bygone era await you. Exquisite synthesis of nature's wild pulse with the sophisticated sublimity of colonial comfort, elegance and style. 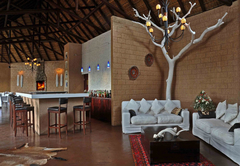 Each of the tented Safari Suites find easy residence within Acacia-thorn and Combretum Bushveld. The opulent interior appointments draw inspiration from the colonial ethos, with only the wildlife as witness of the invigorating outside shower for two. Joined only by the glazed patina of the African sky, these king size units redefine the concept of solitude. 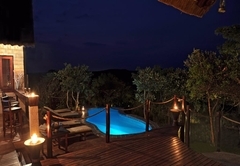 Here after an exhilarating day in the African bush you can journey into dreams' domain, as the jackal yelp and the Kudu bark through your window of stars. 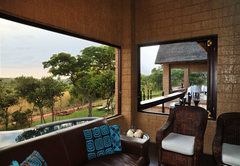 Two Executive suites – Madiba and Rafiki recently upgraded offering 5 star comfort. Each king size suite has a an open plan lounge area with flat screen TV, satellite service & mini bar leading to a private deck with plunge pool. 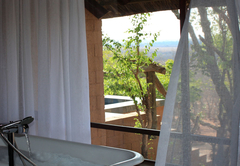 The luxurious en-suite bathroom with ball & claw bath, his and her’s basins, separate toilet & bidet and spacious shower. 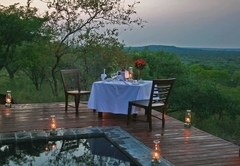 The ideal spot from where you can enjoy the tranquil sounds and beautiful sights of the African Bushveld. Royal African, the epitome of regal opulence and grandeur. 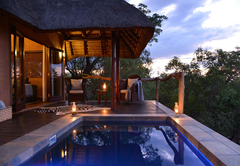 Immerse yourself in the gentle sounds of nature with breathtaking views of the African Bushveld. Personal service and absolute privacy. The suite contains a lounge with satellite television, en-suite bathroom with ball and claw bath, his and hers basins, separate WC and bidet and outside shower for two. Private viewing deck with plunge pool. Exquisite synthesis of nature’s wild pulse with the sophisticated sublimity of comfort, elegance and style. Explore Zwahili's masterful cuisine inspired by African Flavours yet guided by the Western culinary tradition. Leaving the most discerning palate in awe. 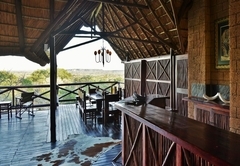 Venture out for a pre-packed bush breakfast for two, while the gazelle graze and watch inquisitively. Game viewing, conducted by experienced ranger offers sighting of lion, giraffe, leopard, civet cat, zebra, blue wildebeest, eland, impala, kudu, bushpig, warthog and numerous smaller antelope. Bird watching - over 400 species of African birdlife with rare sightings such as lizard buzzard and brown snake eagle. The world renowned Nylsvley Bird Sanctuary is in close proximity for aspiring bird watchers. Guided bush walks and excursions ascending "Witkop" go back in time to when the "bittereinders", at the helm of Boer General, utilised this koppie as a hideout from the British for almost two years. "Witkop" stands proud in bearing homage to a period in history long since forgotten. 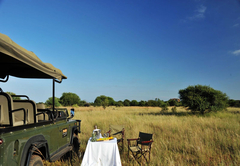 Day and night game drives and guided walks. 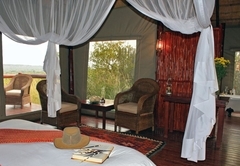 African safaris, photo safaris, over 400 species of African bird life. Star gazing, swimming pool and conference facility. 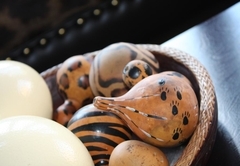 The main lodge suites are decorated in a classic African style, with comfort and relaxation in mind, each room has a private balcony, from where guests can enjoy the fresh Bushveld air. 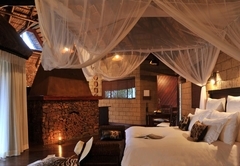 Embrace a true African experience in comfort and style in this King size suite. 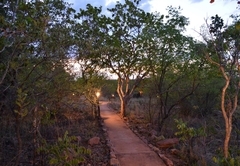 Within walking distance from the main lodge building, creating a truly isolated and private environment where one can be in touch with Africa's unique and unspoilt beauty. 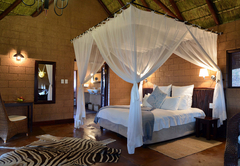 A Colonial canvas safari suite under thatch. 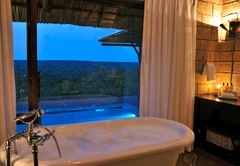 The suite contains a Victorian style en-suite bathroom with only wildlife as witness of the invigorating outside shower for two. King size suite with an open plan lounge area with flat screen TV, satellite service & mini bar leading to a private deck and plunge pool. The luxurious en-suite bathroom with ball & claw bath, his and her’s basins, separate toilet & bidet and spacious shower. 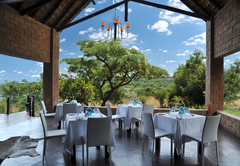 The ideal spot from where you can enjoy the tranquil sounds and beautiful sights of the African Bushveld. The epitome of regal opulence and grandeur. 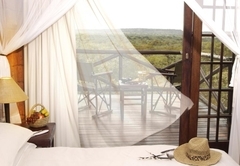 Immerse yourself in the gentle sounds of nature with breathtaking views of the African Bushveld. Personal service and absolute privacy. The suite contains a lounge with satellite television, en-suite bathroom with ball and claw bath, his & hers basins, separate WC & bidet and outside shower for two. Private viewing deck with plunge pool. We really enjoyed our stay. Lovely large chalets, excellent meals, friendly and knowledgeable staff. Highlight was the plunge pool. Thanks so much! Delightful place where one can find peace and tranquility in nature, not so far from busy JHB-Pretoria. 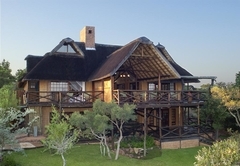 Absolutely professional and friendly staff , and beautiful accommodation nestled in the natural habitat of the private game lodge with spectacular views over the veld . 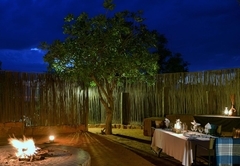 Peaceful nights gazing at stars and listening to the resident lions cared for under a conservation program. Learn about the natural habitat from a passionate and extremely knowledgeable game ranger. You will not see all of the big five, but will see the small five, and learn about the bush ecosystem. Child policyChildren 12 years and older are welcome, children under 12 years are welcome by prior arrangement.